State statute (A.R.S.) 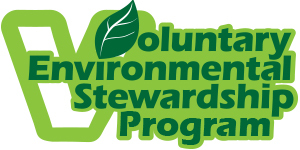 §49-192 required the Arizona Department of Environmental Quality (ADEQ) to develop, implement and manage a Voluntary Environmental Stewardship Program (VESP) in 2012. This program identifies and rewards organizations that have a good history of compliance, and try to go above and beyond legal requirements. ADEQ strives to complement existing programs with new tools and strategies that not only protect people and the environment, but also recognize opportunities for reducing cost and encouraging technological innovation. Organizations and businesses are invited to join VESP to work together on environmental quality issues and support ADEQ’s mission - to protect and enhance public health and the environment in Arizona. Membership incentives for joining VESP include: recognition, reduced inspection frequency, conferences, early notice of enforcement rulings, advance inspection notice, reduced reporting requirements, and coordination of multiple on-site inspections. Members will be invited to participate in discussions about incentives that might be added to the program. 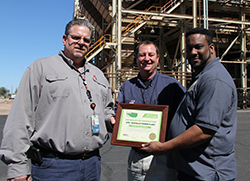 APS Ocotillo Plant Manager, Andre Bodrog (left) and Environmental Scientist Derek Bresee (center) received their VESP certificate from ADEQ’s Ian Bingham (right). 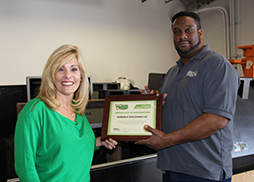 The APS Plant was accepted into VESPas a Platinum member, with the additional designation of Superior Compliance History. 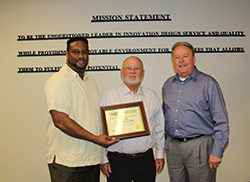 ADEQ’s Ombudsman Ian Bingham (left) delivers a VESP certificate to Doug Hawken, President of PING (right) and John Solheim, CEO of Karsten Manufacturing (center) for their environmental efforts. PING is a platinum level, charter member of the VESP program. The VESP offers five categories of recognition. Copper Level – This category is a one-time level of recognition that is issued annually. The Copper Level recognizes partnerships and collaborations, or regulated facilities that have completed an environmental project that resulted in measureable improvements to the environment. Bronze Level – This level of recognition is available to regulated facilities for a three-year term only. The Bronze Level recognizes those facilities with no environmental violations discovered by a regulatory environmental agency within the past three years and the recipient must maintain this standard while a member of the VESP. Site visits may also be conducted at a facility applying for the following levels to assist ADEQ in determing the appropriate level of benefits. Have made measureable environmental achievements (e.g. reducing pollution, conserving natural resources, etc.) in the past in at least one of the areas for continuous improvement as defined by ADEQ. Commit to measure continued improvement in the same or another area for the membership term. Have made measureable environmental achievements in the past in at least one of the areas for continuous improvement as defined by ADEQ. Committed to developing and maintaining an environmental management system (EMS) within three years of becoming a member. Commit to measuring continued improvement in the same or another area for the membership term. Have made measureable achievements in the past in at least one of the areas for continuous improvement as defined by ADEQ. Have completed one full EMS cycle, including an annual audit. To apply for membership with the VESP, please click here. (Please note, versions of Microsft office older than 2007 may not open the document correctly). *Regulated facilities cannot have any open enforcement actions at the time of appli cation for membership in the Program. ADEQ will recognize regulated facilities with no violations on record with any environmental regulatory agency within three years with a “Superior Compliance History” designation. This designation will be forfeited upon discovery of an environmental violation while a member of the Program. The applicant has the choice of continuing to measure achievements for the same environmental indicator in subsequent years or select a new or additional environmental indicator to measure.